If there’s one thing we’ve learned from the movies it’s never to underestimate the impact that an underdog with a dream can have when they’ve been given the opportunity to make that lifelong dream come true. And this often utilized cinematic adage is doubly familiar when it comes to animated tales of underdogs that undertake heroic quests over the course of a three act film. But as popular as these plotlines are in contemporary CG fare with so many studios copying the successful formulas employed by their rivals to serve up slight variations of the same bankable themes, they’ve also proven so profitable that some animators go back to the well of their own material, cranking out a new spin of a past production before other studios can do the same. Whether it’s Disney’s Planes spin-off from Pixar’s World of Cars that was originally intended to go straight to DVD or Dreamworks’ Puss In Boots film line that spiraled off the monstrously successful Shrek series, ticket buyers and home video consumers have been treated to a lot of the same over the past decade in an increasingly crowded post-Pixar children’s entertainment market. And eager to prove that Hollywood isn’t the only place to create vibrant animation, while Japan’s Studio Ghibli and England’s Aardman Animation have been influential for decades, other countries have begun to follow suit in a big way, releasing a wide variety of critical landmarks and contemporary favorites from France’s Persepolis to Israel’s Waltz With Bashir along with many other entertaining and enlightening offerings from around the globe. Russia has joined in over the last few years, increasing their budgets to create some vastly detailed animated fare including some features that play off of the same plotlines and franchises made popular by Disney. Their outstanding attention to detail was most notably on display in the country’s recent gorgeous adaptation of Hans Christian Andersen’s fairytale The Snow Queen which was dubbed in English and released on DVD at the same time that Disney’s Frozen took the box office by storm in late November of 2013. Although it has none of the pomp and circumstance nor the classical style of the Andersen fairytale, the country’s latest venture to release in the states also ties into Walt Disney with the release of the new Lionsgate DVD send-up of Planes with the aptly titled Wings. 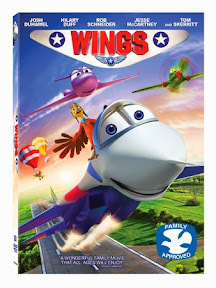 Using the same basic Cars-like plot that Disney also utilized for their recent aviation based animation, Wings milks the underdog formula for all its worth as we meet our aspiring world class flyer and small-town plane Ace (voiced by Josh Duhamel) who, through a one in a million opportunity, winds up accidentally being offered the fifth spot on a championship team just one month before the Super Wings Trophy Competition. Taking all the help he can get from the film’s requisite wacky sidekicks, Ace befriends Rob Schneider’s wisecracking wingman and unsolicited advice giving bird Dodo, who becomes the surprise scene-stealer of the film as Schneider dives into voice work with the same energy we used to witness from him on Saturday Night Live. While predictably, Ace also encounters a new love interest voiced by Hilary Duff as Windy, when Ace’s determination and passion inspires Top Gun alumni Tom Skerritt’s veteran coach to come out of hiding following a tragic accident, Ace incurs the wrath of a bullying competitor who tries to manipulate Windy and Ace into losing his place in the race. Of course, it’s nothing we haven’t seen before and Disney’s far more sophisticated individualized animation made the aircraft characters come much more vibrantly to life in Planes. Nonetheless, I must say that much to my pleasant surprise and largely thanks to Schneider’s sterling voicework and the witty English language adaptation from scripter Mychal Simka, filmmaker Olga Lopato’s energetic, brightly colored children’s film is far more entertaining than I thought it would be. As such, it ultimately reminds viewers that we never can underestimate an animated underdog as Wings takes flight – captivating the imagination of young viewers for the fun-filled ride along the way.